As with each Stargate Franchise series, there are enemies worthy of nightmares. In the SG-1, we had the Goa’uld and Ori. In Atlantis, we had the Wraith and Asurans. The Lucian Alliance was first introduced to us in SG-1. When the Goa’uld lost to the SGC, there was a power vacuüm. And as with all power vacuums, there’s always someone who rises up to take the place of the previous baddies. The Alliance is essentially a space mafia which consists of mercenaries, smugglers and thugs (oh my.) When the Goa’uld were destroyed or fled, quite a bit of their technology was ripped off by most of the humans they’d enslaved. Some of the humans sold the tech; while others smuggled and trafficked it. Banding together, the criminals decided that they’d make more money and be harder to subjugate again if they were one big syndicate. Netan, the leader of the Lucian Alliance, then had about 20 “Seconds” who ran each of the divided territories. The head of the Lucian Alliance, Netan worked with the SG-1 team to eradicate the Ori. After helping route the Ori, one of Netan’s Seconds named Anateo tried to convince Netan to go after the T’auri. Netan didn’t think they were a threat and refused. 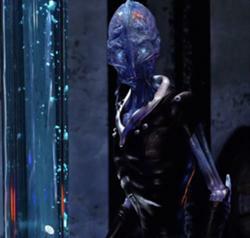 Anateo tried to overthrow Netan by trying to take over the Odyssey, one of the hyperdrive ships created by the T’auri. His plan kind of backfired, especially when Vala “accidentally” beamed him into space. As I alluded to last week, the Lucian Alliance had a member of the SGC working for them. Through an undercover investigation led by Dr. Rush and Colonel Young, the L.A. were able to take over Destiny and wreak havoc. They believed that with the Destiny they could take over more galaxies. I’d have to say they were a bit to ambitious in this idea. These tall, skinny, creepy aliens were first encountered by accident. As I stated last week, Colonel Young ended up switching bodies with one which wasn’t attached to the Long-Range Communication Device. The Nakai aliens were the first race encountered which had space flight capability. Equipped with a device for reading minds (to learn about other species and their languages), and with advanced technology, the Nakai’s bodies are frailer than humans. Dr. Rush was able to knock one down if that gives you an indication. After connecting with Colonel Young, the Nakai found and attacked the Destiny and kidnapped Chloe. They experimented on the poor girl and infected her with a pathogen which changed her appearance and intellect. You’ll have to watch the series to find out what happens to her. In another form of attack, the Nakai used the LRCD to take over one of the crew and sabotage the ship. Thanks to being able to track the Destiny the Nakai continued obsessively chasing the ship. In my opinion, the final enemy would be the result of a Borg cube and a Cylon ship having a baby. I’m talking about the Berzerker drones. These agile fighters have one goal in life–to destroy all technology that is not their own. It was postulated that the drones were created long ago during a war. Evidently, both sides either perished or called a truce; however, the Drones weren’t disassembled. They were left “asleep”. A race called the Ursini accidentally woke them and a new war ensued. After becoming allies, of a sort, with the Ursini, the crew of the Destiny were targeted by the unfeeling robotic killing machines. Stargate Universe, the third and final television series of the franchise, only lasted 2 years. I honestly believe, that had the series been allowed to continue, we would have had many more stories with the Nakai and Berzerker drones. Sadly, the series ends with everyone, except for one person, going into stasis pods. A continuation movie was supposed to have followed the end of the series, unfortunately it never came to fruition. May 2011 brought us the end of the Stargate Franchise on television. However, it wasn’t the end of the Multiverse. Join me next week for my final post celebrating Stargate, as I dive into the DVD movies, video games, comic books and books.